Richard Goddard has been fighting the good fight for all of us on a number of fronts. I don’t know where the man gets his energy. If the history books are written as they should be, there will come a day when all Bajans come to understand the great service he has given this country in speaking out against social and environmental injustices. Mr. Goddard’s sense of public justice and right vs wrong has sometimes even brought him into conflict with his family’s interests – yet he persists because he cannot stand to see abuses of our land and people. We’d love to print both in text, so if someone can ask Richard to send us the Word or text file we’ll reprint it here which makes it searchable and findable on Google, etc. Or… if someone wants to retype the text from the article we’d be grateful. We’ll publish the Greenland piece on Tuesday, so for now we’ll start with the Public-Right-Of-Way advert which we have scanned. You can read the whole thing by clicking the photo at the top or here. When The Police Fail To Investigate Their Own – How Can The Force Maintain Public Respect? According to an article in the Nation News, Magistrate Pamela Beckles lambasted the Royal Barbados Police Force for poorly investigating wrong-doing by police officers. Magistrate Beckles stated this as she was forced to dismiss assault charges against three Special Services Unit constables who were accused of assaulting surfer Matthew Kydd and a student Kane Garrett some four years ago on May 5, 2004. Four years delay. Just think of the mischief that had to be done by the police to delay they case four years! The police had not investigated the matter well enough according to the court. This was even though the Nation News had published photographs of the assault in progress as a reporter had stumbled upon the scene. The prosecutor’s file was a joke containing no statements by the complainants, no investigating officer in charge and no witness list or identification parade. The case had been programmed for failure by the police who didn’t want to lay charges against their own. Did you know that the Barbados Police Complaints Authority was (sort of) established in 2004, but that it never met once from April 2005 to mid 2007? What a disgusting fraud this BPCA is. It was put in place as a political tool so the BLP government and the police could say that the issue of police oversight had been effectively addressed. Fraud. 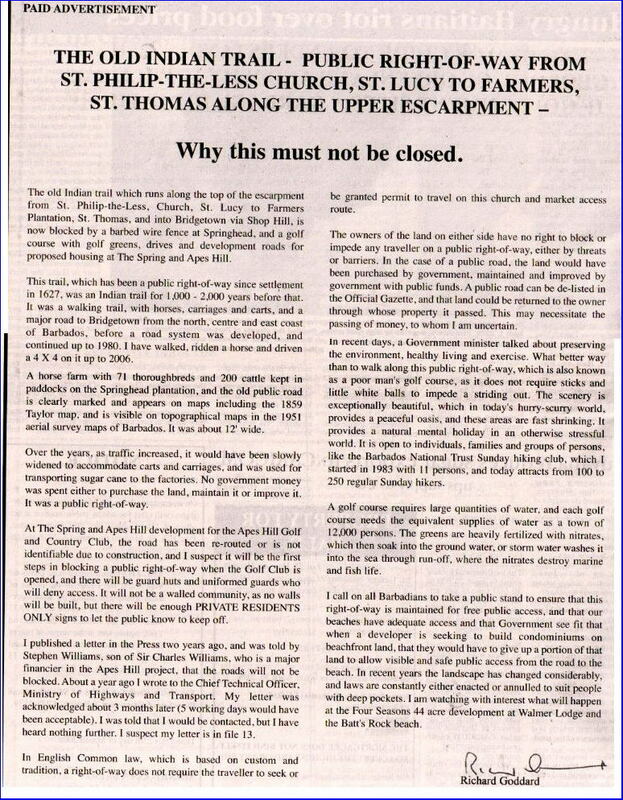 That’s exactly what was perpetrated on the people of Barbados, and it continues to this day. Here are some questions… basic, ordinary questions that might be asked by any citizen. Go ahead… see if you can find the answers. Fraud, I tell you. Fraud. Who are the members of the Barbados Police Complaints Authority? What is their contact information? Where does one make a complaint directly to the Barbados Police Complaints Authority so the police will not have to handle the complaint in any way? Where are the offices of the Barbados Police Complaints Authority? What is the contact information: phone, fax number and email address? What are the standards of the BPCA for receiving a complaint? What is their mission statement? Who are they responsible to? What is the chain of command for the BPCA? What decisions do they make and by what criteria? Do they have a legally mandated duty to report to complainants within certain time periods? When, where and how often do they meet? How many complaints did they investigate in the last year? What were the dispositions of those complaints? What is the nature of their investigations? Do they have independent investigators assisting them? What a joke. What a fraud.